Montreal's Bboyizm returns to Vancouver with Music Creates Opportunity. This realization came out of workshops the company did with Sylvain Lafortune, who has a ballet background and a PhD in partnering. Soglo found analyzing the mechanics of partnering fascinating, and has always wanted to go back to these ideas that he had begun exploring a few years ago. “I never got a chance to get deeper and explore that possibility,” said Soglo. While creating his new show, he brought Lafortune back and worked with his dancers to explore what partnering means for street dance. 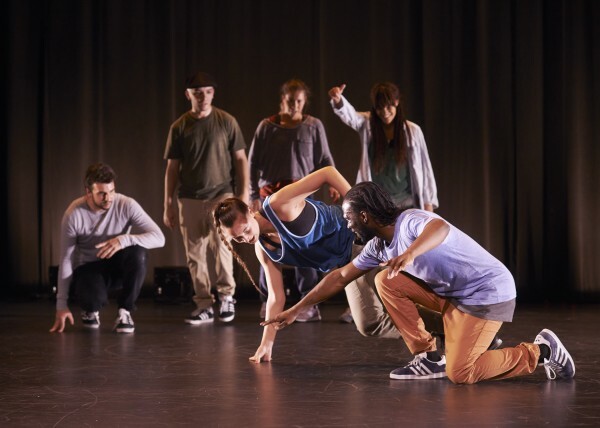 “I wanted to create something that has the principles of partnering, but for street dancers. I call it ‘rhythmic contact,’” he said, explaining that the music is their partner, as they make contact with the rhythm. Bboyizm first performed in Vancouver in 2012 with their impressive, energetic show, IZM. They’re back this month with Music Creates Opportunity, and Soglo said the troupe is excited to be back on the west coast. This show marks the first time the company will have live music, and there are also some new street dance styles featured in Music Creates Opportunity. “IZM was 90 per cent bboying and 10 per cent rocking,” said Soglo. This show includes bboying, lots of rocking, house, and pantsula — a South African street dance style which bgirl Melly Mel will perform. “The vocabulary we’re using is from different dance styles. It comes out in a very interesting way,” said Soglo. This pure expression that comes from within is what the dancers of Bboyizm strive for, and it shows in their impressive physical feats and dynamic, smooth moves. BBoyizm is performing Music Creates Opportunity October 21 to 26 at The Cultch and October 28 at the Surrey Arts Centre. For more information, visit thecultch.com.